Isaiah Chapter 18 Star Chart: Clockwise "from before the harvest, when ... the (white) sour grape is ripening in the flower (Sennacherib), (when) he (Cepheus; YHWH) shall both cut off the (Milky Way) sprigs with pruning hooks (Scorpio is the pruning hook attached to a red radius line), and take away and cut down the (Milky Way) branches" (18:5) in 701 B.C. (Many scorpions stung the sleeping soldiers), till the gold sun coin "present (is) brought unto the Lord of Hosts by the people" (18:7) (Gemini-Egyptians) at the dawn of the Millenium in 2026 A.D. is 2726° years. From 701 B.C. till 2026 A.D. is 2726 years. Since 7 laps x 360° = 2520 years, we have 206° years beyond seven complete laps. 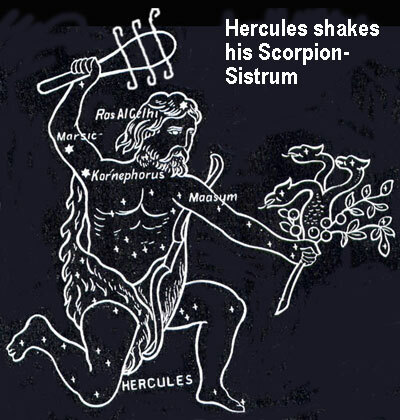 Notice that Hercules, Gemini, Orion and Cepheus all are shaking a Sistrum [which looks like Scorpio] in celebration of YHWH's achievement as the music plays. Herodotus’ story of an attempted invasion of Egypt frustrated by mice eating the Assyrian leather bowstrings and quivers may reflect a plague epidemic during Sennacherib’s Palestinian campaign; this possibly underlay the story (in 2 Kings 19:35; Isa. 37:36) of the decimation of the Assyrian army by God’s destroying angel in 701 B.C. Herodotus writes that the Egyptian leader Sethos prayed to his god for help in defeating the massive Assyrian force, and the god sent into the Assyrian camp “a swarm of field mice [who] gnawed through their quivers and their bows, and the (leather) handles of their shields as well, so that the next day, weaponless, all they could do was flee, and their losses were heavy” (II.141). Interestingly, he attributed the destruction to a divine intervention, a lack of “reverence” for “the gods” (The Histories II.141). The Zodiac indicates that a plague of scorpions stung the feet of the sleeping Assyrian soldiers with their black crescent stingers causing white blisters and death. Assyrian records state that Sennacherib took forty-six fortified cities and captured numerous other smaller communities. Sennacherib bragged that he took 200,150 captives (men and women, young and old). He further stated that he shut up Hezekiah as a prisoner in his royal palace, “like a bird in a cage” (Pritchard 1958, 200). But no mention of capturing Jerusalem. Sennacherib’s army had carried on a successful war of three years’ continuance against the Egyptians, but now the Egyptians were freed from the yoke and could celebrate with a sistrum. "In the fourteenth year of King Hezekiah (sole reign: 716–697 BC), Sennacherib, king of Assyria, went on an expedition against all the fortified cities of Judah and captured them. Hezekiah, king of Judah, sent this message to the king of Assyria at Lachish: "I have done wrong. Leave me, and I will pay whatever tribute you impose on me." The king of Assyria exacted three hundred talents of silver and thirty talents of gold from Hezekiah, king of Judah. Hezekiah paid him all the funds there were in the temple of the Lord and in the palace treasuries ... That night the angel of the Lord (Scorpio) went forth and struck down 185,000 men in the Assyrian camp. Early the next morning, there they were, all the corpses of the dead. So Sennacherib, the king of Assyria, broke camp and went back home to Nineveh. When he was worshiping in the temple of his god Nisroch, his sons Adram-melech and Sharezer slew him with the sword and fled into the land of Ararat" (2 Ki. 18-19). "But after he had proved his [Hezekiah's] fidelity by such deeds, Sennacherib, king of Assyria, came. He invaded Judah, besieged the fortified cities, and proposed to take them by storm.... His officials said still more against the Lord God and against his servant Hezekiah, for he had written letters to deride the Lord, the God of Israel ... They spoke of the God of Israel as though he were one of the gods of the other peoples of the earth, a work of human hands. But because of this, King Hezekiah and the prophet Isaiah, son of Amos, prayed and called out to him. Then the Lord sent an angel, who destroyed every valiant warrior, leader and commander in the camp of the Assyrian king, so that he had to return shamefaced to his own country. And when he entered the temple of his own god, some of his own offspring struck him down there with the sword" (2 Chr.32). 18:1 Hear ye, land of the Egyptian winged sistrum, Egypt, termed the land of the winged timbrel, or cymbal (which was an instrument of music peculiar to the Egyptians in their sacrifices to Isis), which borders upon the rivers of Ethiopia. Orion and Hercules both are shaking sistrums and Scorpio looks like a giant sistrum. It is curious that the top bar is bent up on one side just as Scorpio's claw is bent up in the Zodiac. Was the noisemaker designed to commemorate this event? 2 That sendeth ambassadors (Gemini) by the sea, even in vessels of bulrushes upon the waters (Gemini using red radius line pole to push the Milky Way vessel through the shallow water), saying, Go, ye swift messengers (Gemini), to a nation scattered and peeled, to a people terrible from their beginning hitherto; a nation meted out and trodden down, whose land the rivers have spoiled (Egypt has black-Zodiac topsoil due to Nile flooding)! This circumstance agrees perfectly well with Egypt; Pliny, Lucan, Diodorus Siculus, and Strabo, all affirming that the Egyptians commonly used on the Nile a light sort of ships, or boats, made of the reed papyrus. It is a nation stretched out and smoothed by the overflowing of the Nile. It seems plainly to relate to the overflowing of the Nile; which, as it were, claims Egypt to itself, while it overwhelms with its waters the whole land, except the cities and towns, secured by the banks raised about them. It is true, this overflow is rather an advantage than a disadvantage to the land, as it renders it fruitful; nevertheless it puts the inhabitants to very great inconveniences during its continuance. Terrible also well suits the Egyptians, whose kingdom was one of the most ancient, and continued long to be extremely formidable. And they were wont to boast extravagantly of the antiquity and greatness of their kingdom, asserting that gods were their first kings, and then demi-gods, and lastly men. 3 All ye inhabitants of the world, and dwellers on the earth, see ye, when he (Sennacherib in 701 B.C.) 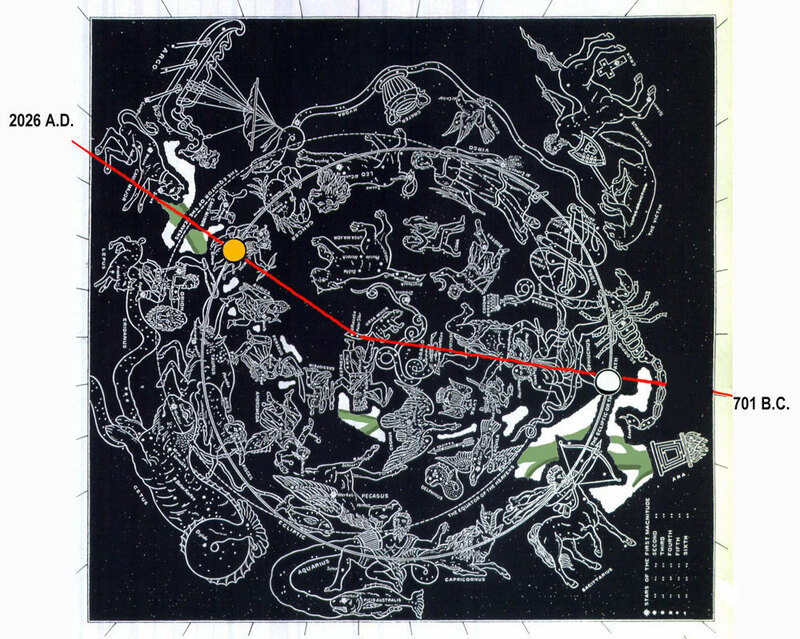 lifteth up an ensign on the mountains (solar or lunar flag on Milky Way mountain); and when he bloweth a (red radius line tube with sun or moon bell at the end) trumpet, hear ye. “We have here the declaration made to the other people of the world, to expect the fall of the Assyrian. God invites all the people of the earth to this sight; that, as soon as they should observe the sign appointed by God, namely, the standards lifted up by Sennacherib, on the mountains of Judea, and the sound of the trumpets of the hostile army preparing to besiege Jerusalem, they should attend to the execution of this divine judgment.” — Vitringa. 4 For so the Lord said unto me, I will take my rest, and I will consider in my dwelling place like a clear heat upon herbs, and like a cloud of dew (Milky Way cloud) in the heat of harvest. While the Assyrian is forming designs for the destruction of my people, I will seem to rest, as if I had no regard for their preservation. The reader will observe, God is said in Scripture to rest, or sit still, when he does not work on the behalf of a person or people; as, on the contrary, he is said to bestir himself when he acts for them. And I will consider in my dwelling-place — Namely, in the heavens, what time will be most proper for the execution of my purpose upon these proud blasphemers of my name, and persecutors of my people. This is spoken after the manner of men. Like a clear heat upon herbs, etc. — The meaning of these metaphorical expressions is, that God would not so rest as to lay aside all care and regard for his people; but that he rested with the best and most benevolent purpose of comforting them after this affliction, and of giving them refreshment, like that of a serene heat after a heavy rain, or a cloud of dew in the time of harvest. 5 For before the harvest, when the bud is perfect (Gemini's gold bud on Milky Way vine), and the sour grape is ripening in the flower (Scorpio's white gibbous moon grape on Milky Way vine), he shall both cut off the sprigs with pruning hooks (red radius line connected to Scorpio's tail pruning hook), and take away and cut down the branches (Milky Way branches -- green and white; Hydra branch -- black) (185,000 Assyrians dead in one night). Here the Lord informs his people how he would act toward those of their adversaries, for whom he had prepared this great slaughter. He compares them to a vine, which, after it hath sent forth its buds, then its flowers, and the flowers the sour grapes, which too were beginning to ripen, is suddenly stripped of its shoots and branches by the pruning-hook of the vine-dresser, who leaves them, burdened with grapes, a prey to the fowls of heaven, and the beasts of the earth. By which allegory, continued through this and the sixth verse, the prophet means, that, when every thing respecting the Assyrians was in the most promising situation, when Sennacherib’s great designs seemed almost mature, and just ready to be crowned with success, his mighty efforts should be in a moment frustrated, his vast expectations rendered abortive, and the chief part of his immense army made a prey to the beasts and birds. 6 They shall be left together unto the fowls of the mountains (Aquila, Cygnus, Lyra and Corvus), and to the beasts of the earth (Leo, Ursa Major Ursa Minor): and the fowls shall summer upon them, and all the beasts of the earth shall winter upon them. 7 In that time shall the present be brought unto the Lord of hosts of a people scattered and peeled (Gemini brings a gold coin -- 2026 A.D.), and from a people terrible from their beginning hitherto; a nation meted out and trodden under foot, whose land the rivers have spoiled (black Zodiac topsoil brought from Nile), to the place of the name of the Lord of hosts, the mount Zion (Milky Way hump). In that time — After the execution of this signal judgment; shall the present be brought unto the Lord, etc. — Here the prophet foretells that Egypt, being delivered from the oppression of the Assyrian, and avenged, by the hand of God, of the wrongs which she had suffered, should return thanks for the wonderful deliverance, both of herself and of the Jews, from this most powerful adversary. “The Egyptians,” it must be observed, “were in alliance with the kingdom of Judah, and were fellow-sufferers with the Jews, under the invasion of the common enemy Sennacherib; and so were very nearly interested in the great and miraculous deliverance of that kingdom, by the destruction of the Assyrian army. Upon which wonderful event it is said, (2 Chronicles 32:23,) that many brought gifts unto Jehovah, to Jerusalem, and presents to Hezekiah; so that he was magnified of all nations from thenceforth. And it is not to be doubted, that among these the Egyptians distinguished themselves in their acknowledgments on this occasion.” These offerings, then made from Egypt and other nations, were a prelude of a more perfect conversion of the Gentiles to the God of Israel; and there is nothing more certain than that God, after the remarkable overthrow of Sennacherib, was like the clear heat after rain, and like dew in the time of harvest, to the people of Israel. See Bishop Lowth and Vitringa.